Tillithia loves living in Palmerston Heights. She loves her school. She loves hanging out with Lily, her next door neighbour. But most of all she loves the school holidays. Sometimes she goes with her mum and Lily to a market for breakfast, or they ride their bikes to the park. This morning Tillithia has a plan. Tillithia might have plans for this holiday day, but so does Mum. And Mum’s plan is not the same as Tillithia’s. Tillithia and Mum are off to Goose Camp with Auntie Doreen. Mum knows Auntie Doreen will help Tillithia to learn Aboriginal ways. Tillithia just remembers their last trip, when she got wet and dirty and ate mussels that tasted like snot. She’d much rather stay in town. But that’s not going to happen. Tillithia begins by sulking but is gradually won over by curiosity and the good humour of Mum and Auntie. Eventually, Mum’s teasing stops when Tillithia helps Auntie gather food for the old ladies. Now it is Tillithia’s turn to tease. Bush Holiday has coloured illustrations throughout and uses several text types to highlight different words. The ‘Mates’ series from Omnibus has many titles. Each is full of humour and tells a tale that is particularly Australian. 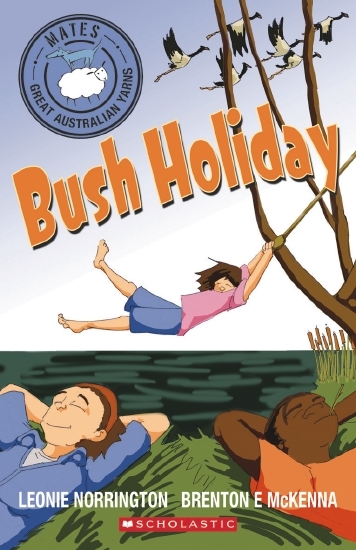 In Bush Holiday the reader travels to Northern Territory and is taken on a road trip holiday. It is a story of family, and learning and sharing. Tillithia experiences a different sort of education in the holidays, where knowledge of and respect for the land are taught in an active way. Bush Holiday gently reminds the reader that life is full of learning and that there are many teachers. The joyfulness of Mum and Auntie as they travel and teach their reluctant student is delightful and should resonate with readers young and not-so. And when Tallitha reflects on her unexpected bush holiday, it is the connection with the land and her greater family that she remembers most fondly. Recommended for newly confident readers.